A coalition of former U.S. Government leaders and industry experts is opposing the bankruptcy sale of A123 Systems to Chinese autoparts maker Wanxiang Group on national security grounds. While the bankruptcy sale of A123 Systems' assets to Wanxiang America Corporation was approved by the bankruptcy judge, it still must face government approval. On Thursday, the Strategic Materials Advisory Council reaffirmed their opposition to the sale of A123 Systems to the American subsidiary of Chinese autoparts maker Wanxiang Group. In opposing the sale, the SMAC is calling on the Committee on Foreign Investment in the U.S. (CFIUS) to carefully scrutinize, and presumably block, the sale on national security grounds. The issue isn't A123 Systems existing product line, but instead a technology breakthrough the company announced last summer. Their Nanophosphate EXT technology promises to be a breakthrough that will greatly expand the range of applications for lithium-ion batteries. This technology makes it possible to use lithium-ion batteries without heating or cooling systems, in either cold or hot weather, and have little performance degradation or damage to the battery pack. Existing lithium-ion batteries get damaged in hot weather, or freeze up in cold weather, and as a result electric car makers tend to put heating and cooling systems in the cars to ensure good performance and battery pack lifetime. Nissan has been criticized for using only passive air cooling in the Nissan Leaf which is believed to contribute to the battery pack capacity loss in hot climates. On the other hand, Coda Automotive likes to play up the active thermal management system on the Coda electric car. 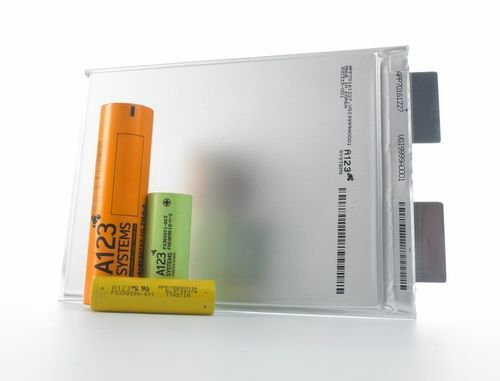 If the A123 Systems Nanophosphate EXT technology really performs as predicted, electric cars could rely on passive heating or cooling systems without suffering damage to the battery pack, and without having the added expense of a thermal management system. The SMAC issued a myth-busting fact sheet that centers on A123's Nanophosphate EXT battery technology, as well as A123's role in supplying batteries to the U.S. Military. The Nanophosphate EXT battery technology, according to the SMAC, makes A123 Systems unlike other lithium-iron-phosphate battery suppliers. There's a long list of patents that have yet to be awarded to cover Nanophosphate EXT, and the extent of trade secrets and other knowledge puts the company way ahead of the pack. The technology is, according to the SMAC, especially well-suited to U.S. Military applications that have harsh operating conditions. The Military had been working with A123, and in the bankruptcy agreement Navitas agreed to buy the portion of A123 Systems which dealt with those military contracts. SMAC is concerned over whether Wanxiang, a Chinese company, will then have control over parts and components used in U.S. Military equipment. This theory is based on the following factoids: Wanxiang's senior executive team have been members of the Chinese Communist Party for decades, hence any technology falling into Wanxiang's hands is just one step from the Chinese Government. Secondly, this acquisition of A123 Systems follows a pattern of "Chinese outward direct investment since the late 1990s to acquire and obtain breakthrough technology from foreign countries, leveraging Chinese production of raw materials to draw high value-added manufacturing to China." The line of thinking is that even though Wanxiang won't have access to the former military subsidiary of A123 Systems, Wanxiang will still be capable of building battery products for the Chinese military. Further, Wanxiang will be manufacturing cells for Navitas in the same facilities Wanxiang will run in Michigan, and will supply Navitas with cells, cross-license the core technology and share certain physical assets for use in the government/military business. In other words, a Chinese company (in some eyes, China is the enemy of the U.S.) will be supplying parts to the U.S. Military and will therefore be able to subvert the independence of the U.S. Military. A flaw in the SMAC's reasoning is the limited future usability of lithium-iron-phosphate batteries. The LiFePO4 chemistry was a tradeoff between safety and energy density. LiFePO4 batteries are highly regarded as a safe lithium-ion technology, but have lower energy density than other lithium-ion chemistries. In the next few years newer lithium-ion chemistries will come on the market at much higher energy density and lower cost than LiFePO4. An example is the Envia Systems lithium-ion battery technology, that GM is apparently planning to use in an electric car by 2018ish. Both Envia Systems and GM is conducting some research and manufacturing work in China already. It means that LiFePO4 batteries are likely to be supplanted within a few years, but China is still the primary "go to location" for conducting advanced battery research and manufacturing. “The Council continues to call on the Committee on Foreign Investment in the U.S. (CFIUS) to carefully scrutinize the sale of A123 Systems to Wanxiang. Supporters of the sale have attempted to allay our concerns and those of dozens of Democratic and Republican Members of Congress by downplaying the criticality of A123’s technology. Their arguments contend that A123’s technology can be segregated by application; we continue to assert that these claims are questionable, and the pending sale poses a longterm threat to American economic and national security. Just one example of those concerns is the fact that the Pentagon would still rely on Wanxiang’s technology and supply chain for future U.S. military operations and equipment, even though the company did not acquire A123’s government contracts business. The battery is the bussiness of next 10 years. Chinese company knows it and that is why this company paid 2 times higher price than Johnson Controls. Behind of it is strategic decision of Chinese government. And what about US authorities ? They sell it. If this investment is good for China why is not for America ? US authorities doesn't think strategically, they numerates losses a tries to make quick patch. A123 company had have all master cards in its hands. Only thing that hadn't have was operating money. The right solution is long term loan from US authorities as investment to the future and change of management as request from creditors. This is a look from perspective next 10 years. Battery bussiness will increase dramatically in next years. US taxpayers payed the whole development of perspective technology, unfortunately Chinese taxpayers will take profit. And from this perspective this sale is bad decision.